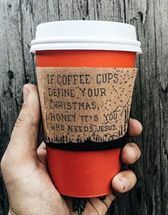 Millions of American Christians, who worship a God with whom I’m not familiar, are upset about Starbucks forgoing it’s traditional snowflakes, doves and trees on its signature holiday cups. As a Christian pastor myself, I’m sure he’s right about that. Starbucks quite obviously “hates” Jesus, who surely loves him some Starbucks and no doubt worries all day about how the company has lost its way. Christianity had been under siege from the start of the 21rst century, when Satan’s minions began a “War on Christmas” in the now-defunct Christian nation of America. From that starting point it took 15 years for Christianity–a faith tradition that had survived against all odds for 2,000 years–to finally go down in that fateful year, 2015. That’s the year that Starbucks–an American corporation led by the Devil’s 4- and 5-Star Generals (the “Stars” in “Starbucks”) used its buck privates (the “bucks” in Starbucks) to dispense coffee in plain, cranberry-red, anti-Christian paper cups. This war campaign was an act of genius by the Devil. For even though Starbucks had never served coffee in cups with the traditional “Merry Christmas” greeting, it dawned on a large number of Christians that this omission of “Merry Christmas” from the cup was a plot to take the “Christ” out of Christmas* and kill God and Christianity once and for all. Many embattled Christians rose up, denouncing Starbucks at every turn, while Satan laughed with delight. He laughed because millions of Americans continued to feed their caffeine drug addictions by buying Starbucks coffee and drinking it from those seemingly innocent anti-Christian paper cups. America’s greatest defender of Christianity–Fox News pundit Bill O’Reilly–fought the good fight against the determined persecutors of America’s Christmas tradition to the end. But O’Reilly–who long ago had coined the term “War on Christmas” and juiced up that war at every turn as it happened to get freakish ratings every December–well … he put up the good fight to the end. But not even God could stand up to America’s “War on Christmas,” much less O’Reilly, whose ratings, btw, made him equal with God in America. “I can’t take it anymore, Devil! My chosen Christian nation America–the nation I spared even though it enslaved and terrorized blacks and exterminated the native peoples–just doesn’t accept ‘Merry Christmas’ as the only Season Greeting anymore! “And now it’s come to THIS! Those CUPS at STARBUCKS! 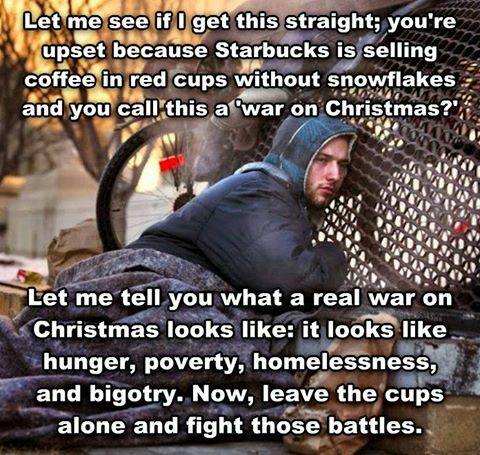 Though some of the dumb buck privates in Starbucks’ famous chain of coffee shops were Christians themselves, they were the useful idiots who dispensed coffee to the caffeine addicts all over America in those innocent-looking cranberry red cups during the Christmas Season. Never mind that “Happy Holidays” had been used interchangeably with “Merry Christmas” on Christmas cards and as a traditional greeting since the end of World War II. Today, many people look back on December 2015 and blame the Starbucks Corp. for the final fall of God, Christianity and Christmas in America. But let history and the record show that it was all the work of the Devil himself, he who used Starbucks as the place to finally overtake God and wipe out a faith that had existed for 2,000 years. To learn more about the fall of God, faith, Christmas and the now-defunct Bible–none of which could withstand the annual “War on Christmas” in America–visit the church-turned-museum nearest you, where some stimulating and tasty Starbucks coffee is always on. *Some of the “bucks” who served coffee at Starbucks were Jewish and were never comfortable saying “Merry Christmas” to anybody anyway. *To add insult to injury, the Pyramids that Joseph had used to store corn in biblical times collapsed the day that Christmas and Christianity in America went down–more of the Devil’s handiwork. It’s almost as if some people go looking for things to get upset about. If this is our nation’s biggest problem, we’re in pretty good shape, I say. Unfortunately, it’s not even in the top 1,000. Of course, it’s not even a problem, but that’s beside the point. When I was a kid in the 1950s, “Happy Holidays” was a popular greeting used by businesses and the citizenry. I always thought it was simply being polite as one never knows what faith traditions people follow, yet most everyone celebrated some type of ‘HOLIDAY’ between late November and the end of the year. It wasn’t an issue until Fox News made it one. I know! I have scores of Christmas cards from the fifties that people sent to my parents and probably half say “Happy Holidays” and not “Merry Christmas.” Bill Moronic Bill O’Reilly at Fox keeps this nonsense going every year with his “War on Christmas” because wars get ratings. It cheapens what Christmas is about–the Incarnation of Christ and the spirit of giving and doing unto others.